Summer is almost over in London and you know what? No one cares. Not a single soul. Why? Because summer in London is nothing to write home about. The weather is ‘meh’ to say the least, the tourists are wild and there’s almost no British spirit in those rare sunny days. The summer is here to serve as a placeholder, a filler episode of sorts between the real seasons – spring and autumn. Luckily, the latter is almost here. The cozy sweaters, warm cocoa, and an intriguing book are but a breath away. This calls for a salute of popping jolly umbrellas, don’t you think? But what is it that makes autumn so magical in the Big Smoke? London is vibrant and colorful during all seasons. Most of those colors, however, come from the neon of Soho and the lights of Trafalgar Square. The rest is either somewhat green during the summer or somewhat white during the winter. Autumn brings the reds and the yellows and the beige into the mix masterfully, You will see lovely fallen leaves under your feet even in the center where there are no trees. Then there is the weather. It’s windy. It’s rainy. It’s British. No, really, when else would your oversized scarf look so cool? Ok, that’s just the lyrics. 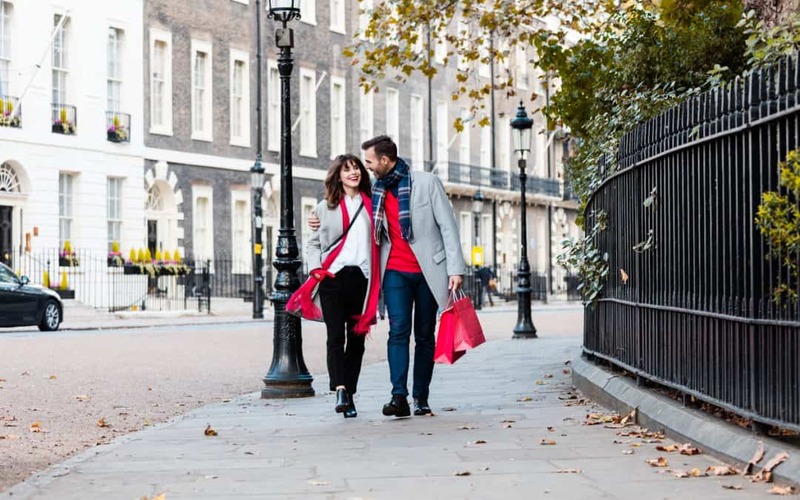 What are the actual benefits of autumn in London? Are you a social media star in the making? Do you need more likes from people you barely know and total strangers for that matter? Would you like to shine brighter than Brad Pitt in the spotlights? The answer is simple – yellow leaves. A photoset with, in and on them is the ultimate source of social engagement on the web. The method is simple and proven by millions, so what’s holding you back from internet fame? Ok, all jokes aside, any park in London is a selfie fan’s dream come true. But they also offer so much more, especially during the autumn season. Take a look at the Richmond Park for an example. It’s huge – the largest park among the London’s Eight and it is populated with more than 600 deer. And do you know who’s rutting season happens during the autumn? Then there is the Sky garden – your very own autumn, but indoors. No rain, no wind, no noise, just the sights you were dreaming to see all throughout the year available to you here ad now. And you are lucky enough to book a visit during the evening hours you will catch one of the most gorgeous sunset views known to man. The Kyoto Garden is the quintessence of color during autumn. It’s Japanese vibes help calm down and find inner peace while it’s unrivaled beauty awakens the artistic beast in your heart. I swear to god I was painting there more than once even though I never came with pencils or paints. Magic. Ok, ok, I’ll stop with the puns. But that doesn’t mean you can’t have fun during the three months of autumn. Especially when it’s so darn hard not to have any. Why? Because autumn is the season of entertainment, take music for one. The number of festivals, concerts and shows is off the charts! You will be hearing tunes on every corner from Ronnie Scott’s to Juno to St. Martin-in-the-fields with free classical concerts and much more. Then there is the street food that’s already surpassed the status of “culture” in London and is now successfully becoming a “cult”. With the Great Big BBQ Fest and the London Brunch Fest opening the season on September 1, you will fall down into the pits of gluttony from which there is no escape. Or maybe there is. Who knows? No one was ever looking. Speaking of the devil, if there is anything Londoners love more than street food – its brunch. We’ll have Hip Hop brunch and Retro Bowling Brunch parties this fall just to name a few. Still, the fallen fun isn’t all about food or parks in London. There will be a lot of amazing features for you to see and take part in during the season of 2018. The Grid – a brand new project from the famous Lollipop, the pioneers of the new frontier of entertainment will allow you to dive into the fictional journey towards saving the world from malicious AI. Not only will you wear the cape of a futuristic hero, but there are also cocktails involved! The 17 HIX events that will be taking place between September 7, 2018, and November 22, 2019. The guys from HIX can truly bring something as common as eating or drinking to the next level and make a show out of it. Hurry up though, because many of the tickets are already sold out. The Official Camden Oktoberfest is expected to be a blast this year as well. You’ll have everything from traditional German food and beers there to some of the wildest music performances the British Isles have ever seen. The Old Dirty Bastards (the music band headliners) are out of this world so if it won’t be the beer that gets to your head first, they will surely finish the job. The London Octoberfest. Yes, we have more than one. How could we not with our foodie culture? Two whole weeks of great beer and yummy sausages. I already can’t wait! Yes, as you have seen, there is much more to autumn in London than people usually think. But that’s not important. They are, after all, random people. What really matters to us is you, your thoughts and ideas, Feel free to join our Facebook group and share all of them in a cozy atmosphere, surrounded by friends. Start the conversation with #MyAutumnInLondon is and feel free to create a story from there. I am, as always, hoping to hear from you soon.